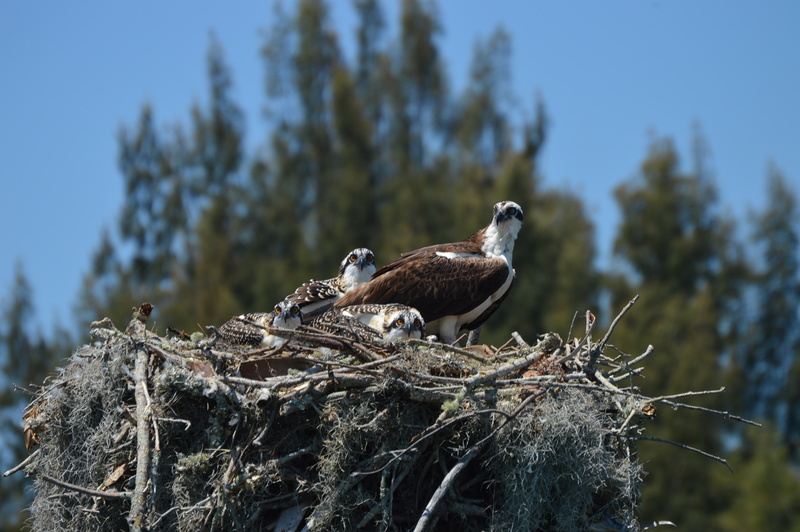 On several Channel Markers in the Indian River, Florida, families of Osprey make their nests. It is a beautiful site and if you are fortunate enough to be able to ride aboard a boat, you may get a very close look at the parents and babies in these nests. Be warned that the parents will rise, squawk and push their shoulders forward as if they are about to take flight – aiming for your face. Please go slow or idle for a few moments and then move along. These birds are majestic, fierce, delicate and sweet all in one moment. Their nests are very large intricate installations of art in some very precarious places. Two of the nests we photographed were built atop channel markers that triangular. It seems impossible that these enormous woven nests can dangle atop the peak of a sign…and yet they do with such stability and strength that I was left in awe. Isn’t that what we strive for in our lives. We have somewhat messy lives, homes and hearts that are held together by available scraps and hope. I looked at these Ospreys and thought of myself. I was reassured. I feel like my life is a bit tattered, thrown together and teetering in the wind. I saw them working as a team to protect, build and feed and fly. I have a new vision of my sometimes chaotic and unraveling life. I am that Mother Osprey. I am proud of my nest with its moss and twigs fluttering in the breeze. I protect and cherish my children and work with my husband to keep the balance, keep the strength, keep the majestic power of our lives. On a long road trip our family is put through exhaustion and boredom. We share stories, laughter and tears. We have snacks, diaper changes and scenery changes. On another ride from FLorida to New York we decided to stop in North Carolina for a night of rest. My three year old was screaming at me every time Kung Fu Panda disappeared. It was on ABC Family which means…commercials. She flipped out. I tried to explain. I gave up and stared at her in amazement. My daughter cannot understand the concept of commercials while I still get amazed by pausing or rewinding ‘live’ television. We are in such completely different technology worlds. She HATES commercials. I guess that is a good thing as it will hopefully limit the impulsive shopping requests.